This Tibetan 'thangka' shows Heruka embracing his partner. The terrifying aspects of the painting indicate the force necessary to defeat the powers of evil and ignorance. Deities have many heads, arms, and eyes because of their universal, all-encompassing nature and the extensiveness of their abilities. 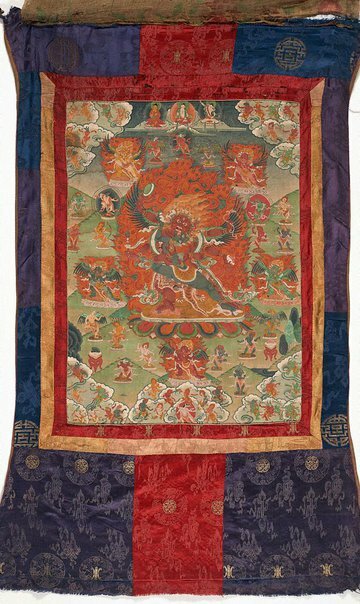 In Tantric Buddhism, the combination of male and female divinities shows that truth cannot be divided. The combination of wisdom (associated with the female) and compassion (associated with the male) is essential to reach Buddhist enlightenment. Some images, like 'Heruka and a partner', show sexual union, which symbolises the amalgamation of these two forms of knowledge, as well as the non-duality of truth.